Thank you for taking the time to review the proposed plans for the redevelopment of The Computer Centre site on William Street. 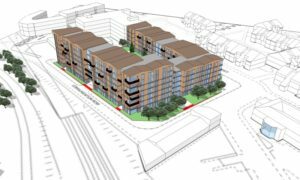 Brooke Smith Planning has been appointed by William Street Company Ltd. to pursue the preparation of a full planning application for demolition of the existing building on site, and the construction of 230 residential apartments. The existing building on site is currently vacant, however it previously functioned as a data centre and is known as The Computer Centre. The current building is relatively dated and unattractive, providing an ideal opportunity to develop a high quality residential scheme in this central, accessible location of Birmingham. The proposed development will be arranged over five storeys fronting William Street, and seven storeys fronting Communication Row. The lesser five storeys will respect the amenity currently enjoyed by existing residents of William Street. A rise to seven storeys along Communication Row is considered appropriate, given that the character of this area changes from residential to commercial, and it is bound to the east by the railway line and canal. Vehicular access into the site is proposed to be from Communication Row, with approximately 67 car parking spaces being provided within a courtyard area, and covered cycle parking also being provided for future residents. Occupants will also benefit from shared amenity space within the courtyard. Please note, this consultation period will close on 17th March 2017.